New England heiress Marguerite Chapin Caetani, the ‘American Princess’ of biographer Laurie Dennett’s recent book (Mcgill-Queen’s University Press, 2016), was one of the twentieth century’s pioneering literary owner-editors. In Paris during the 1920s, she used her personal fortune to produce the modernist review Commerce, convinced that access to good writing was not an option or a luxury, but a social necessity. Marriage to the Italian composer Prince Roffredo Caetani in 1911 made Italy her adopted country, and from 1932 until her death in 1963 she resided there. Serious gardening at the Caetani estate of Ninfa provided a refuge from fascism, and she was thus able to make a lasting contribution to one of Italy’s most outstanding gardens. Her greatest achievement, however, was the international review Botteghe Oscure, begun in 1948 to provide a forum for young Italian writers in the aftermath of fascism and war. During the next 12 years Marguerite Caetani went on to fund and publish the work of more than 600 writers in a dozen languages, ensuring that Botteghe Oscure played its part in creating the international literary community we enjoy today. Laurie Dennett: Born in Toronto, Canada, Laurie Dennett has spent much of her professional writing life in the City of London. She is the author of eight corporate histories, including those of Prudential, the Institute of Actuaries, and law firm Slaughter and May. 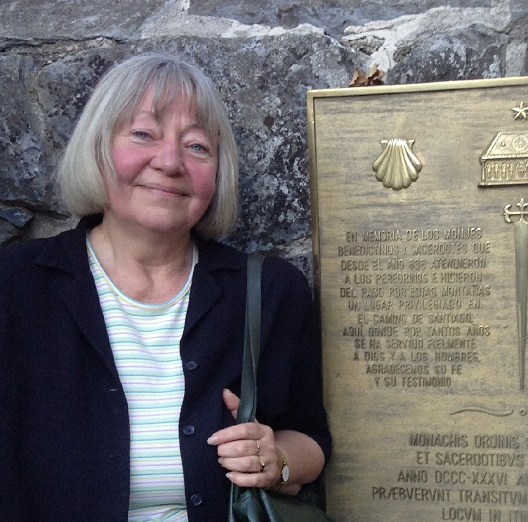 She raised nearly $500,000 internationally for multiple sclerosis research through her pilgrimages on foot to Santiago de Compostela, Rome and Jerusalem, and wrote a travel book, A Hug For The Apostle (Macmillan of Canada, 1987) about her walk from Chartres to Santiago. From 1995 to 2003 she chaired Britain´s Confraternity of Saint James. She has also translated several Camino-related books from Spanish. She lives in the province of Lugo, Galicia, where she continues to write and translate, and to welcome visitors to the first and only Quiet Garden (affiliated with the U.K.-based Quiet Gardens Trust) in Spain. ...This is a brilliant and vibrant biography that left me deeply moved as I finished the last chapter, where Dennett considers the legacy of Marguerite. It’s a remarkable story, well told, beautifully conceived, and rich with learning. Dennett knows her stuff, and she writes clear, swift prose that nicely suits her subject. Her tone — one of quiet respect — never falters.